Go directly to jail Bill Cosby. Do not pass go. GO DIRECTLY TO JAIL. DO NOT PASS GO. 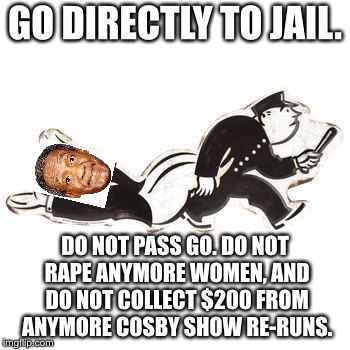 DO NOT **PE ANYMORE WOMEN, AND DO NOT COLLECT $200 FROM ANYMORE COSBY SHOW RE-RUNS.